CRM Business Units (except for the root Business Unit) can be deleted since CRM 2011. A Business Unit can be deleted only after it is disabled. All related records such users, child business units, teams, facilities/equipment, resource groups, etc. 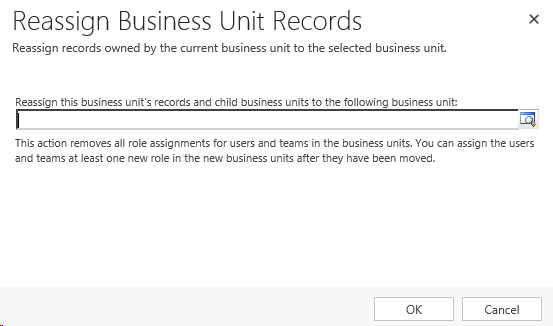 to the business unit need to be removed or unassociated (assigned to another business unit) in order for the business unit to be removed from CRM. A note regarding “The default business unit team cannot be deleted” – Every business unit has a default team (created automatically) and cannot be deleted. 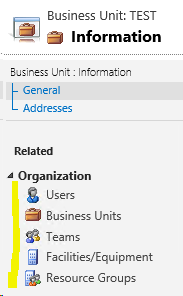 There is no need to first delete the default team because the default team will be AUTOMATICALLY deleted when the associated business unit is deleted. Final note: Unless there is a very good reason to delete existing CRM Business Units that have been in use – I would recommend rename and then disable them to save analysis/preparation time and minimize impact to production operation. You still have the option to delete them in the future if needed. Contact me if you are looking for Microsoft Dynamics 365 CRM design and implementation help. Workopia, Inc. – Keeping up with the Cloud Innovations! This entry was posted in CRM 2011, CRM 2013, CRM 2015, CRM 2016, Dynamics 365, Microsoft CRM, Microsoft Dynamics CRM, MS CRM and tagged Business Unit Delete Remove. Bookmark the permalink.